Condo Blues: The Easiest DIY Laundry Stain Remover You Will Ever Make! The Easiest DIY Laundry Stain Remover You Will Ever Make! After my allergy test revealed a lovely grid of red dots indicating I’m allergic to even more annoying things than I realized, I got a ton of information from the doctor about things I can change around the house to help me deal with the unpleasantness. That’s how I ended up with a giant jug of unscented high efficiency laundry detergent that makes my front loading washing machine stink. Reek, actually. I can’t return it. 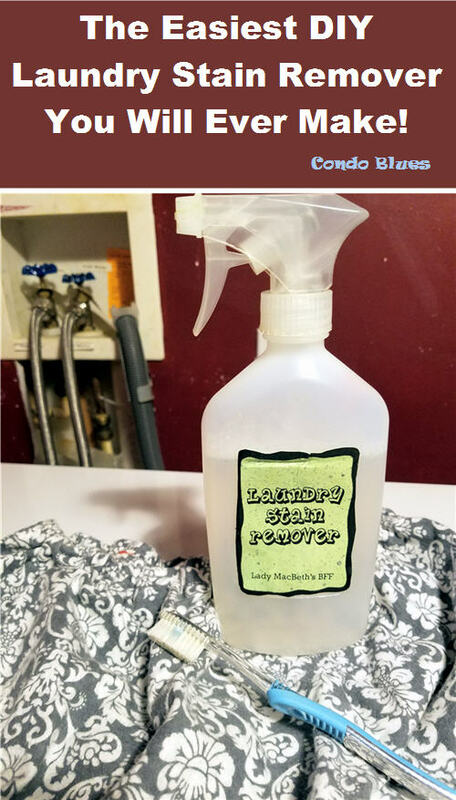 I don’t want to use it as laundry detergent but I CAN use it to make a quick, cheap, and effective laundry stain remover spray. Which is fortunate because I’ve been crying in my oatmeal ever since they discontinued the plant based version of my all time favorite stain fighting spot remover Shout. Pin this post and share my nontoxic homemade cleaning magic with your friends! A spray bottle. I’m reusing an empty plastic spray bottle. If you don’t want to use plastic, you can buy a glass spray bottle from Amazon here. 1. Pour the ingredients in an empty spray bottle. 2. Screw the spray top to the top of the bottle. 3. Give it a shake to mix the ingredients. I think it helps if you use an old toothbrush (run it through the dishwasher to sanitize it first. it also helps if you mark it with tape so no one tries to use it on their teeth!) as a stain brush on the tough stains like tomato sauce.